So you think you know all about superheroes? Those guys in the capes and the lightly starched spandex speedoes. Leaping tall buildings and always getting the girl. 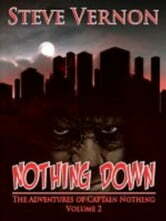 Join Steve Vernon, Nova Scotia's hardest working horror writer, as he takes you into the world of Captain Nothing. It's a world without hope, a world that is as cold and dark as a landlord's heart, three days after the rent is due. It's a world that could give the Batman a case of the squirming night fears. NOTHING DOWN is a collection of stories that will show you the darker side of courage. It will show you the shadows in a hero's heart. Go on. I dare you to take a closer look.